Other than the kitchen, bathrooms are probably the most important rooms in the house. Whether you are trying to increase the value of your home for sale or just remodeling for your family home, the bathroom is a great place to start. Bathroom remodels are not as expensive as you might imagine and you can even create a new bathroom with existing space in your home to add tremendous value. Faucets for the sink and the tub can be pricey, but it is important to choose the highest quality fixtures that fit your budget. In the long run, quality will pay off. Beginning with the sink area, you can often change out the entire sink. Plastic sink models tend to scratch and peel, so look for sinks with porcelain or ceramic finishes. If you have the counter space, add a second sink for a "his and hers" bathroom. Those double sinks are an excellent selling point if you ever place your house on the market. People love them. Showers and tubs are also replaceable. Often, the entire shower area can be removed in just a few steps. Replacing that old tub with a new shower and tub combination can add value to your home. The tiles that surround the bathtub are another easy fix. 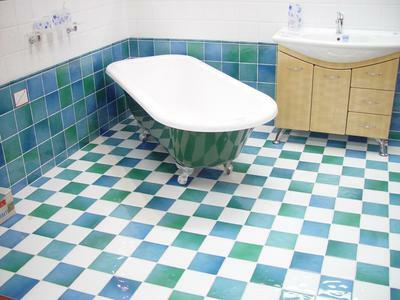 Replace those old tiles with bright new colors and re-grout the area for a totally new look to an existing bathroom. Flooring is another consideration. Worn linoleum can make your bathroom look tired and outdated. Consider removing the linoleum and adding a tiled floor to the room. Black and white tiles are a traditional favorite for bathrooms and can fit any décor – a great selling point. Creating a new bathroom from an existing space in your home takes a little more effort. A large closet or small bedroom can be converted into a half-bath or full bathroom in almost any home. It's a good idea to contact a plumber regarding the pipe placement for the bathroom fixtures. Once you have the bathroom concept in mind, you can begin by hunting for new cabinets. Bathroom cabinets are often sold in sections, similar to kitchen cabinets. You can expand the size of your sink area by adding more sections to the cabinets. Storage is important in the bathroom, as well. Remember that towels and other bathroom supplies take up plenty of space, especially if you store them in the bathroom itself. The more storage space that you can provide in your new bathroom, the more prospective buyers will fall in love with your new home. Whether you design your own bathroom remodel or add a completely new bathroom to your home, the added value will definitely pay off in the future. Homes with several bathrooms are much more desirable than a house with a single bathroom. However, if you have no choice to remain with the one bathroom, there’s no reason why your bathroom can’t be the best on the block. Not only can decorating on a budget be fun, but if creatively undertaken, it can also be done with flair and style. The first thing you should remember when undertaking creative DIY home decor or renovations projects, is that there are no rules except those that you set for yourself. So as long as you are willing to invest your time and energy, then you should be able to make a room go from plain to perfect in no time at all. Join in and write your own page! It's easy to do. How? Simply click here to return to Home & DIY.